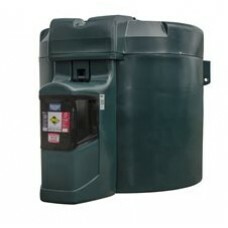 At CHF Supplies, we provide our customers with a wide variety of different liquid storage tanks. We have over 25 years of experience providing our products and services to both businesses and households. A diesel storage tank is a fuel tank that is specifically designed for the safe storage of diesel. As a flammable liquid, it is important that any diesel stored is done so safely. At CHF Supplies, we provide the Harlequin Plastic Fuel Station, which can hold up to 10,000 litres, and the Steel Bunded Fuel Station, which can hold up to 100,000 litres. The smaller Titan FuelMaster range is also available from us, holding between 1225 to 9000 litres, including various options and intelligent tank management. Not only are these diesel tanks capable of storing the liquid fuel, but they are also able to dispense it. Moreover, they are also suitable for the storage of gas oil, kerosene and lubricants. They are supplied with a pump and come complete with either steel doors or a security roller shutter in order to meet all the required UK PPG2 regulations. Our steel diesel tanks feature a double skin and are made to be weatherproof and hard-wearing. The skid-mounted bowsers and highway or site tow fuel bowsers are tested for your peace of mind, fully approved for moving fuel on the highway, as well as during mobile site jobs. Our diesel tanks include Harlequin Plastic Fuel Stations up to 10,000 litres and Steel Bunded Fuel Stations up to 100, 000 litres. Our premium bunded steel dispensing tanks are designed for both storage and dispensing of diesel, gas oil, kerosene, and lubricants. Supplied complete with pump (various options available), steel doors or security roller shutter and meeting all relevant UK PPG2 regulations as standard. Steel diesel tanks are double skinned, offering a weatherproof and durable cost-effective storage solution for complete peace of mind. The skid-mounted bowsers and highway or site tow fuel bowsers are all fully tested and approved for moving fuel on the highway or for mobile site applications. The Titan FuelMaster range is available from 1225 - 9000 litre with a number of options and intelligent tank management.